This critical reflection documents a collaboration between an arts practitioner-researcher and a biomedical engineer in the field of interdisciplinary pedagogy. From one perspective, we read movement as a cultural practice engaging theories of embodiment and informed by dance studies; from another perspective, we study movement as a product of internal and external forces acting on the body and we investigate the science behind the structure and function of human motion. 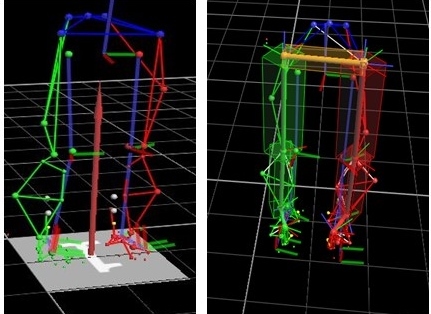 This article reflects upon these differences and considers opportunities for new experimentation within interdisciplinary movement studies, in particular, the co-authors reflect upon the various definitions and affordances of the term ‘bio-mechanical’ and its application to movement and motion capture. The article ends with an overview of the experiments yet to be undertaken within transdisciplinary pedagogy at the Institute for Advanced Teaching and Learning (IATL), University of Warwick. BARTLETT, R. 1997. Introduction to sports biomechanics, New York, NY: Routledge. D'OSTILIO, K. & GARRAUX, G. 2012. Brain mechanisms underlying automatic and unconscious control of motor action. Frontiers in Human Neuroscience, 6, 265. HERON, J. 2015. A different kind of failure : towards a model of experimental theatre as transdisciplinary performance. PhD, University of Warwick. HUTCHINSON-GUEST, A. 2005. Labanotation: The System of Analyzing and Recording Movement, New York: Routledge. KENNEDY, D. 2010. The Oxford Companion to Theatre and Performance. 'Oxford University Press'. MARIEB ELAINE N., H. K. 2007. Human Anatomy & Physiology, San Fransisco, Pearson Benjamin Cummings. MONK, N., CHILLINGTON-RUTTER, C., NEELANDS, J. & HERON, J. 2011. Open-space Learning: A Study in Transdisciplinary Pedagogy, London: Bloomsbury Academic. O'SHEA, J. & CARTER, A. 2010. The Routledge Dance Studies Reader 2nd Edition, London: Routledge. ROACH, J. 1993. The Player’s Passion: Studies in the Science of Acting, Ann Arbour: University of Michigan Press. ROBERTSON D., G. E. 2014. Research Methods in Biomechanics, USA, Edwards Brothers Malloy. SALISBURY, L. & SHAIL, A. 2010. Neurology and Modernity: A Cultural History of Nervous Systems, 1800–1950, Basingstoke: Palgrave Mcmillan. SWITAJ, T. L. & O’CONNOR, F. G. 2008. Chapter 43 - Gait Analysis. The Sports Medicine Resource Manual. Philadelphia: W.B. Saunders. TORTORA GERARD J., D. B. 2011. Principles of Anatomy & Physiology, John Wiley and Sons. WONDEROPOLIS. 2014-2017. National Center for Families Learning. Available: http://wonderopolis.org/wonder/how-do-we-move [Accessed]. YESSIS, M. Jan 2008. Secrets of Russian Sports Fitness and Training, Ultimate Athlete Concepts.